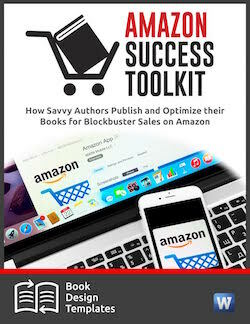 Last week we introduced our new Amazon Success Toolkit, a collection of guidelines and productivity tools for publishers using CreateSpace, Kindle Direct Publishing, or Audible, all portals for Amazon. The response has been impressive, and I can see why. Keeping track of all the policies, procedures, and programs at Amazon is more than most of us have time for. The Toolkit saves a huge amount of time just by bringing this all together in one place. Altogether, it combines a huge amount of training and productivity in one package, including 10 worksheets and checklists that make it much easier to put the ideas into action with your own books. At the center of the Toolkit is the Amazon Success Method, based on four principles about how the giant retailer operates. Understanding how Amazon works gives you an immediate advantage in selling books there. If you are like most people, you shop on Amazon. You are familiar with the way Amazon presents its products, making almost magical suggestions of things you probably want to buy, and how it makes it easy to find and buy almost anything that can fit in a box and get to your door. Amazon makes the experience incredibly easy and fun compared to most retail stores, with lots of product information, pictures, reviews, and choices. All of these thinks make it a great place to buy what you need and you probably go there often. On the surface, Amazon is familiar and we don’t think much about what goes on under the hood of the massive retailer. As customers Amazon creates an experience that entices us to find products we want to buy. However, as an author, you want your product—your book—to be the center of attention for Amazon customers. You need people to notice your book, above the hundreds of thousands of other books. In the split second a customer sees your book, you need them to feel a connection and be enticed to open your book’s product page to learn more. And finally, you need those precious customers to want to read your book and decide to buy it based on what they learned in the few moments they spent on your product page. Amazon customers search, find, learn, and buy in a matter of minutes, sometimes seconds. And they do this with an incredibly competitive number of books to choose from. No matter how good your book is, making your book stand out in the store, connect with customers, and ultimately go home with them, is the difference between selling nothing and being a best-selling author. Imagine if no one noticed Harry Potter and the Sorcerer’s Stone, The Da Vinci Code, or even Fifty Shades of Grey? Getting noticed, and earning the sale is the most important job once you finish writing and producing the book. Amazon is arguably the most important retailer for your self-published book, and selling books on Amazon requires an understanding and mindset that requires us to look under the hood of Amazon and see it for what it is, and what it can really do to help you sell your book. There are four main concepts to wrap your head around to really understand Amazon from a business perspective. We will cover each of these in detail to get you up to speed quickly so you can have an eye toward gaining every competitive advantage and sell more books. I agree with your findings on Amazon’s self-publishing avenues. I actually wrote an article praising Amazon’s publishing endeavors. You state that, “No matter how good your book is, making your book stand out in the store, connect with customers, and ultimately go home with them, is the difference between selling nothing and being a best-selling author.” I agree with that statement wholeheartedly. As a consumer of books, I’ve noticed that many of the self-published titles on Amazon that are lacking. I think it’s great that Amazon is giving authors a chance to share their work on their own terms, but I also feel that Amazon’s platforms allow a lot of “junk” into the marketplace. Great marketing can lead me to a book that I’ll, later on, regret purchasing. My point is great marketing can lead me to the door, but great writing will keep me coming back. I’ve had my eye on Amazon for self publishing for a while now, but I’m mystified by how it all works, and where to start. Of course, I’m also wondering if I would be able to get my work noticed! To me, the big advantages of printing on demand and selling through Amazon are that I don’t have to invest in inventory and operate a warehouse and shipping department. (1) You can sell books on Amazon with autographs or inscriptions, perhaps at a premium price. (2) You can sell slightly damaged books at a discount on Amazon. (3) You can sell older versions of your books at a discount on Amazon. (4) You can sell marked-up proofs at a discount on Amazon. Click on Sell On Amazon on the bottom of an Amazon page.